Green Junk Removal & Recycling provides a safe and eco friendly process for recycling all your e-waste, computer equipment, and all electronics. Our trained and professional staff will pick up all your equipment and take them to a state approved recycling plant for safe and responsible recycling of your items. We also provide safe & secure shredding and destruction of computer hard drives, cd & dvd, floppy disks, usb drives, storage tapes, and pda units. 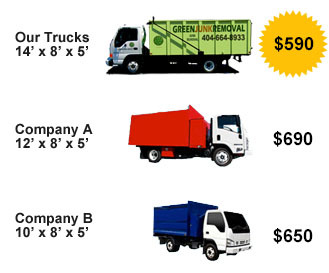 So please call us at 404 664-8933 if you have a need for computer monitor recycling, desk top computer tower recycling, laptop computer reycling, computer hard drive and computer server recycling, e-waste and electronics recycling.